The Sinking of the "Tayleur"
The Tayleur was designed by William Rennie of Liverpool and built for owners Charles Moore & Company. When she was launched in Warrington on the River Mersey on October 4, 1853 - it had taken just six months to build her - Tayleur was the largest merchant ship on the seas. She was 230 feet in length with a 40 foot beam and displaced 1,750 tons, while 4,000 tons of cargo could be carried in holds 28 feet deep below three decks. She was named after Charles Tayleur, founder of the Vulcan Engineering Works, Bank Quay, Warrington. 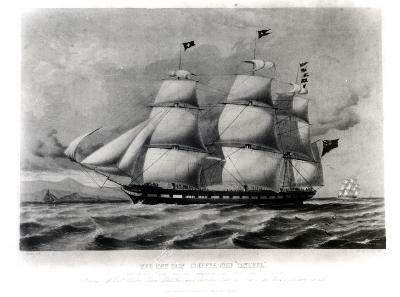 The new ship was chartered by White Star to serve the booming Australian trade routes, as transport to and from the colony was in high demand due to the discovery of gold there. Tayleur left Liverpool on 19 January 1854, on her maiden voyage, for Melbourne, Australia, with a complement of 652 passengers and crew. Her crew of 71 had only 37 trained seamen amongst them, and of these ten could not speak English (a number of the crew were accused in newspaper accounts of the time to be merely seeking free passage to Australia). However, most of the crew survived. Her compasses did not work properly because of the iron hull. The crew believed that they were sailing south through the Irish Sea, but were actually travelling west towards Ireland. On 21 January 1854, within 48 hours of sailing Tayleur found in fog, in a storm and heading straight for land. The rudder was undersized for her tonnage, and when land was sighted through the mists, she was unable to tack around Lambay Island. The rigging was also faulty, and the ropes had not been properly stretched. They became slack, making it nearly impossible to control the sails. Despite dropping both anchors as soon as rocks were sighted, she ran aground on the east coast of Lambay Island, about five miles from Dublin Bay. Initially, attempts were made to lower the ship's lifeboats, but when the first one was smashed on the rocks, launching further boats was deemed unsafe. Tayleur was so close to land that the crew was able to collapse a mast onto the shore, and some people aboard were able to jump onto land by clambering along the collapsed mast. Some that reached shore had carried ropes from the ship, allowing others to pull themselves to safety on the ropes. Captain Noble waited onboard Tayleur until the last minute, then jumped towards shore, being rescued by one of the passengers. With the storm and high seas continuing, the ship was then washed into deeper water. She sank to the bottom with only the tops of her masts showing. One survivor, William Vivers, climbed to the tops of the rigging, spending 14 hours there until he was rescued. Out of the 652 people onboard, 380 lives - many of them immigrants - were lost. Out of over 100 women onboard, only three survived, possibly because of the difficulty with the clothing of that era. The survivors were then faced with having to get up an almost sheer 80 foot (24m) cliff to get to shelter. When word of the disaster reached the Irish mainland, the City of Dublin Steam Packet Company sent the steamer Prince to look for survivors. Although newspaper accounts at the time blamed the crew for negligence, the official Coroner's Inquest absolved Captain Noble and placed the blame on the ship's owners, accusing them of neglect for allowing the ship to depart without its compasses being properly adjusted. The Board of Trade, however, did fault the Captain for not taking soundings, a standard practice when sailing in low visibility. The wreck currently lies in 18 metres of water. The Tayleur has been compared with RMS Titanic . Both were RMS ships and White Star Liners. Technically innovative like the Titanic, both had a serious claim to being the largest ship of their time. Additionally, both vessels went down on their maiden voyages, and inadequate or faulty equipment contributed to both disasters (Faulty compasses and rigging for the Tayleur, and an inadequate flooding control system and lifeboats for the Titanic). Starkey, H. F., Iron Clipper Tayleur - White Star Line's 'First Titanic', Avid Publications, 1999.